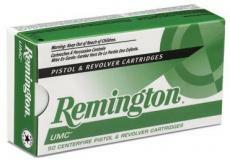 Remington UMC ammunition is made right here in the great United States of America. UMC is built by American's at the factory in Lonoke, Arkansas using first quality components. Remington UMC ammunition is made from factory fresh brass cases, clean shooting Kleanbore primers in order to provide you with the ultimate value ammunition to meet all of your various shooting needs. The UMC line offers you multiple projectile types across a broad spectrum of popular modern calibers. You would be hard pressed to find a better value anywhere else.